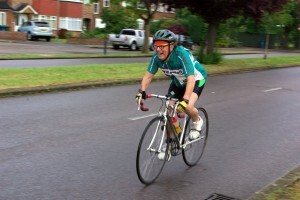 Ron Purdy decided that at 80 he really ought to try a triathalon. 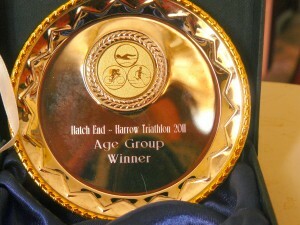 He took part with 250 entrants in the HatchEnd/Harrow Jet Stream triathalon on Sunday. He swam the 400m in 11.16, rode the 17Kms in 44.18 and finished the run in 22.38. His time of 1.23.52 gained him the age category award for 80-84 year olds. His nearest contestant was only 64. He can’t wait for next year to improve his times!!! 6 Responses to Age is just a number. Good work Ron, have you felt the urge to cut the sleeves off your jersey?